This rack shows yarns from the original orange dyebath on the left (more on that later) and the 3rd extraction of the roots on the right (more on that later, too). 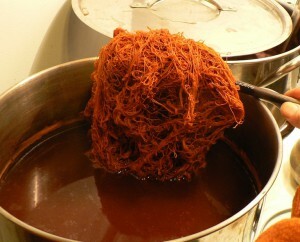 These yarns are from a 2nd extraction of the roots. 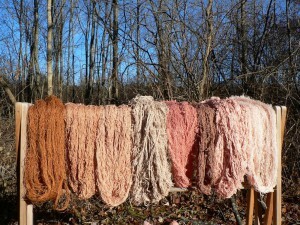 The skein on the far right is the original color of the yarn (white but not bleached). 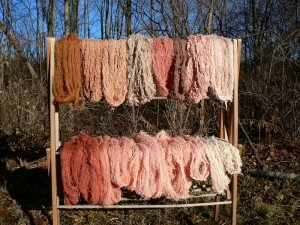 All these yarns are cellulose, i.e., plant-based fibers. They are all either 40/2 linen or 8/2 cotton-linen from Webs. They were all scoured using Earthues‘ anionic scour at 5% weight of the fiber (or weight of the goods, shortened to WOG) and soda ash at 2% WOG. I dissolved the scouring agents in hot water, added the fiber in 8 oz. batches, brought up to 180F for 30 minutes, removed promptly, then washed again with laundry detergent (I use Ecos or Seventh Generation) and rinsed. I mordanted all these yarns with aluminum acetate from Earthues (purchased from Long Ridge Farm). For the first 8 ounces of yarn, I mordanted at 5% WOG. 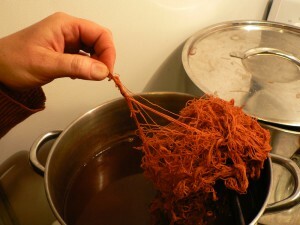 I dissolved the mordant in hot water, then added the yarns, maintained the pot around 100F for one hour, cooled overnight, then rinsed quickly before dyeing. In actuality, the mordant baths often exceeded 100 degrees, but the higher temperatures didn’t seem to hurt anything. I re-used the mordant bath multiple times, using 8 ounces of fiber each time, and adding a half of the original amount of mordant each time. In the past, I have reused aluminum sulfate mordant baths on wool yarns, following Rita Buchanan’s recommendation of using one third of the original quantity of mordant. 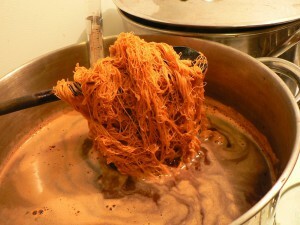 However, since cellulose yarns are typically harder to dye, I decided to use 50% of the original amount each time. I reused the mordant bath four times. The fifth time I added 8 ounces of scoured linen, but didn’t add any additional mordant because at this point I wanted to dump out the bath. I have tried to be more mindful about mordant use since reading Rebecca Burgess’ book Harvesting Color. Like many dyers, I am concerned about the environmental impact of mordants, and I appreciated the data she offers in her book. She had a lab test exactly how much mordant is absorbed by the fibers in a mordant bath. It ranged from 20 to 50 percent for aluminum sulfate. Even though she doesn’t specifically mention alum acetate, 50% seemed like a good rate to me. I mordanted *without* tannin this time because I wanted clear colors without any brown tinge. The one exception is the dark brown skein on the top rack, which is 22/2 cottolin from Sweden, originally dyed with umbilicate lichens, and treated with tannin in the mordant process. It was a blah brown and I was trying to warm it up a little with the madder. Here’s the yarn stretched out a little. It is a spectacular color, but I have to admit I was a little surprised at how orange it was. I have never gotten such an orange color from madder before. How did it happen? Here’s my theory. Thanks to the bustling pace of life in the classroom, the initial extraction of the roots was fairly quick, and only some of the dyestuff from the roots actually went into solution. 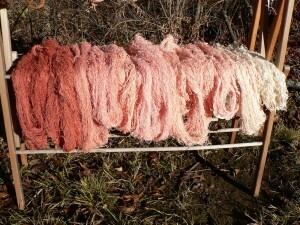 The colors that came out into the dyebath first were yellows and browns. Hence my luscious orange. My next post will have a lot more detail about how I think this happened, and how I eventually got pink.